After waiting 10 years (impatiently), I was absolutely thrilled to learn The Postal Service are finally touring again. And they're coming to Brooklyn! Their album, Give Up, is a modern masterpiece in my eyes. When it was first released, I think I listened to it for four months straight with no break -- and I am still not sick of it. In fact, I still love it. I met Jimmy Tamborello after his Dntel show at Music Hall of Williamsburg last year and his humbleness only increased my fascination and elevated my appreciation for the duo. 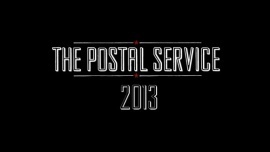 I associate The Postal Service with my college years -- there's a certain nostalgia there. And as an ex-electronic beatmaker, I respect and appreciate their sound. I've purchased tickets for their Brooklyn show in June and am very excited to work on a poster for it. I'm still determining the style I want to implement, though I love the look/feel of each and every one of DKNG's illustrations. Also a big fan of the work of Jason Munn, Noma Bar, Josh Cochran, Frank Chimero, James Gulliver Hancock, Two Arms, The Heads of State, Rich Kelly. Some of you are really far along already, it's great to see the thinking behind the sketches. Mine below are super crude at this point (and pretty awful), just trying to hone in on a concept. Can you let me know what you think of these? Are any worth pursuing? Any feedback is greatly appreciated. Thank you very much. Heavily cropped, vintage envelope with two stamps: one with Ben Gibbard's silhouette and one with Jimmy Tamborello's, similar in style to old presidential stamps. This is a reference to their song "We Will Become Silhouettes." The concert information would be incorporated using the look of postage markings/rubber stamps. Cropped envelope with paper seams that double as subway tracks. Trying to get the idea across of NYC + mail, paying homage to the back-and-forth mailings of CDs that resulted in the Give Up album. Minimal, vector illustration with textures. A mailbox's flag doubles as a music note when a musical staff is laid over top. View from mail slot down towards floor of home. Dog anxiously awaiting the dropping of the mail so he rip it to shreds. Concert information would be written on the letters/packages coming through the slot or could be incorporated more subtly into the decor of the home somehow. Carrier pigeons. I'm not sure why I didn't think of this earlier. Pigeons are an undeniable symbol of NYC, and a carrier pigeon could symbolize the manner in which the album, Give Up, was created, with back-and-forth mailings of CDs. Although birds are quite commonly used for gig posters, I can't say I've seen too many with a carrier pigeon. I'm thinking he could be either A) standing proud on the street, looking directly at the camera, or B) flying over Brooklyn, with the Brooklyn Bridge visible in the background. How does everyone feel about this one? Is the concept worth pursuing? Are the goggles overkill? Thanks very much. I still have not chosen a concept -- it's been a combination of long work hours and not being completely thrilled with any of my options. I think this one may be it, however. I received a lot of positive feedback surrounding concepts 1 and 2, but agree that mail visuals are too obvious/predictable for The Postal Service. So I am turning to the carrier pigeon. A different perspective of concept 5, this one features the same bird, but standing high on a ledge in Manhattan, looking over the East River to Brooklyn (BK Bridge is visible). This is also a reference to the song, "Such Great Heights." The biggest challenge will be choosing a style and rendering the skyline(s)! I have no clue how I will do that yet. I do know I want the colors to be either black and white or subdued, and will most likely place my text at the top. Type treatment will be vintage 1940s, when carrier pigeons were most used. Will probably include secondary type that resembles a rubber stamp/postage markings. If this proves to be too time-consuming, I will follow through with the first sketch from concept 5. Any thoughts/suggestions? I finally decided to go with the left sketch of concept 5. I like the red/blue striped USPS element, but I'm not sure it belongs where I've sketched it -- as a border. Below are some illustration styles and other references for the project. More soon. I am now in the process of drawing individual elements for my composition, which will be landscape in orientation. I decided our carrier pigeon friend will be standing on a fence in Brooklyn by the East River, looking towards Manhattan, with the Brooklyn Bridge visible on the right side. Behind him will be a portion of the Manhattan skyline, but illustrated with only strokes so as not to distract from the pigeon. I've done more research on style and started to fall in love with some World War II propaganda pieces (below the drawing). 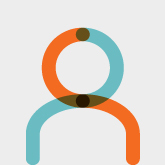 I am hoping to mimic a style similar to this, love the minimalism and shadow treatment. My pigeon is currently too detailed so it will take some work. The colors feel too warm for The Postal Service, so I am leaning towards subdued blues/grays and red.